I’ve done many races now, with 2017 including a race every month and whilst I think I’ve enjoyed them all, there are obviously the ones that really stand out to you. That’s the Great Manchester Run for me. As soon as you hit Manchester city on race day, you can feel the buzz. People everywhere wearing race bibs, family and friends supporting, others just around to spectate. 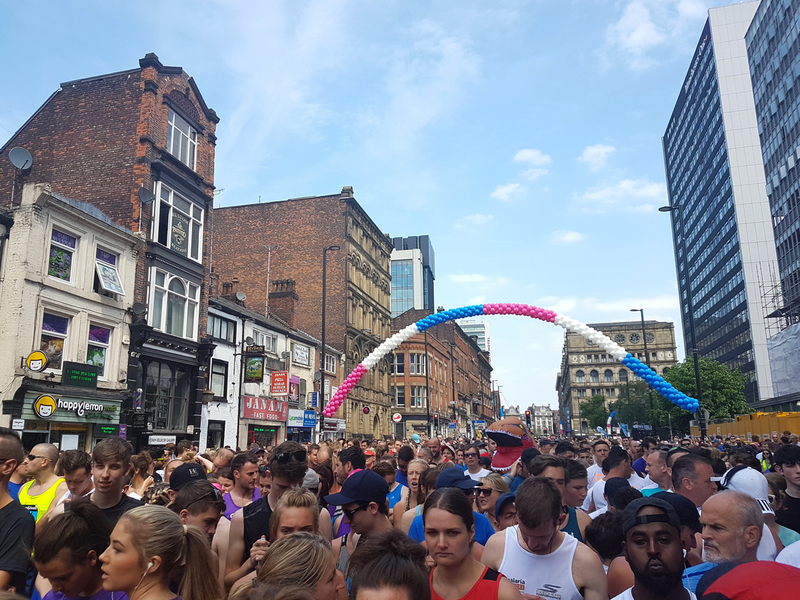 Manchester is always fairly busy on a weekend anyway, but thousands and thousands of people all enter the city for this one event. And it’s great. I’d say that the atmosphere in the city has only gotten better despite last year’s awful events at the MEN where those 22 people sadly lost their lives at the hands of a terrorist. Last year’s race took place not even a full week after it happened, and the day was tinged with a lot more sadness. This year you could still feel that hurt of course, but it also felt like such a positive place to be. Stories like that of Martin Hibbert, paralysed in the bombing and using the past year to train to complete this years race. The Trees of Hope and the memorials left. The city as a whole completely pulled together. 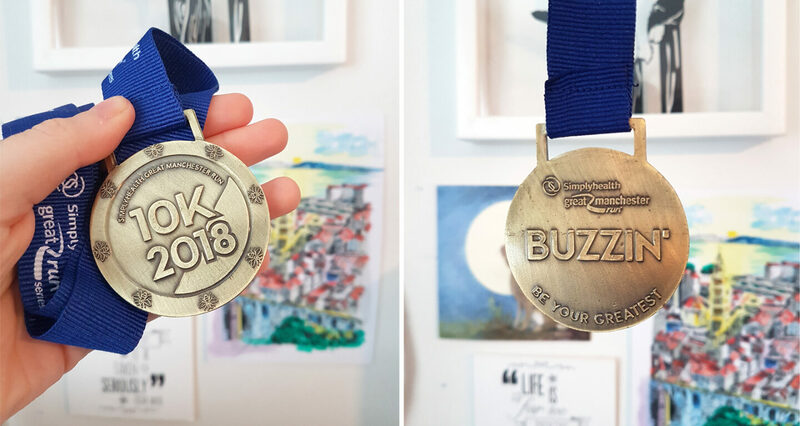 It made for such a big day of celebration, to enjoy the community and just do a great thing, whether that’s raising money for charity, getting a PB, doing your first race or even helping someone else finish. I never really noticed how hilly the area I lived in was until I started taking part in races across the North West. Turns out, a lot of races have horrible hills in them at some point. 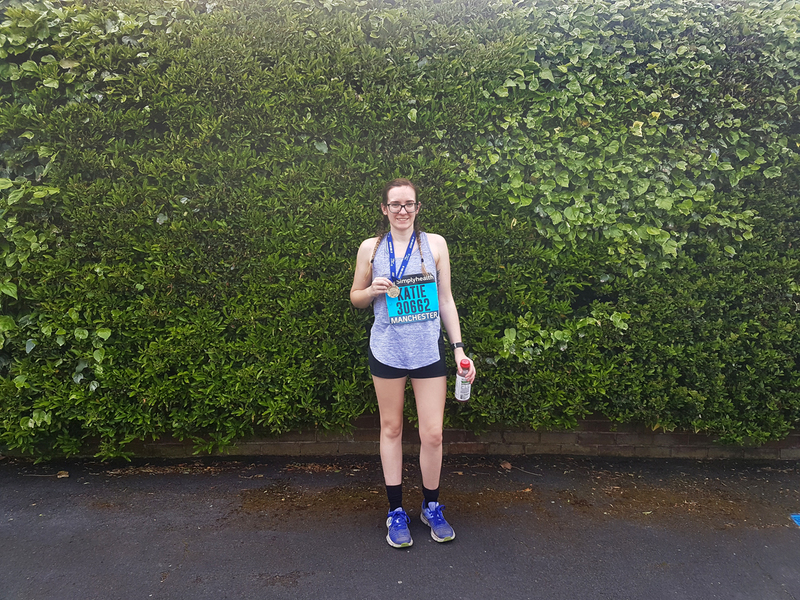 The Manchester 10k course is pretty flat, and that’s always a nice change. What I quite like about this course is that it is a simple out and back run really. 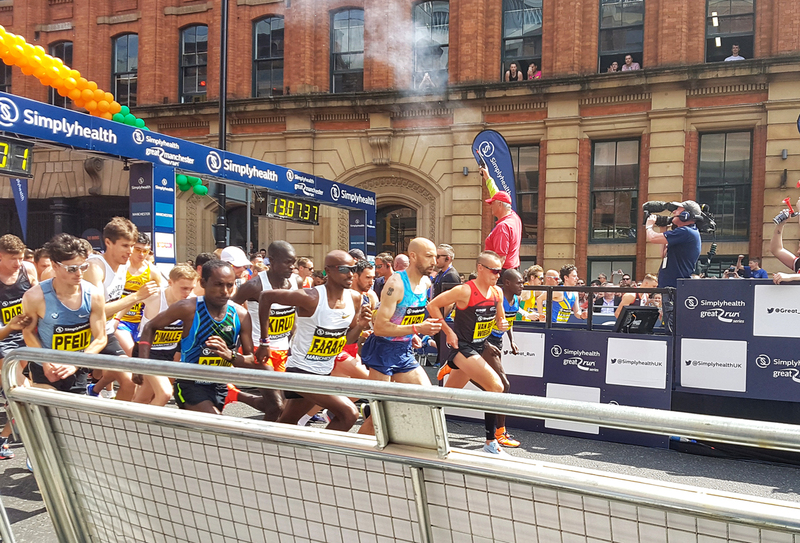 It can get very congested at times with the crowds that run, but I think if you were aiming for PBs and managed to get in the first wave you’d be okay on that front. The majority of this course is manned by either charity buses, music or the general public. There are just a few bits through an industrial area that are quiet. 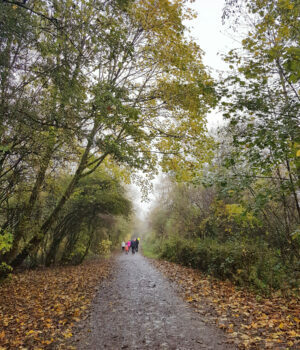 You can be having the time of your life, or struggling with the speed you’ve gone out at, the high temperatures, the cold temperatures (it is Manchester of course – you never know which you’ll get in May!). Whichever it is, there will be hundreds of people lining the streets with banners, signs and shouting encouragement. There’s even a section towards the end where they are all handing out jelly babies! And the finish line – I’ve never done a race with one like it. (Though granted, Manchester is the biggest course I’ve run.) 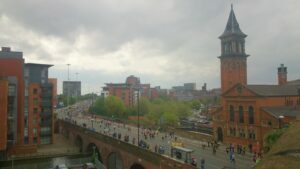 You get to a bridge right at the bottom of Deansgate, and you know that there’s probably a couple of hundred metres to go to the finish line. The noise is deafening here. 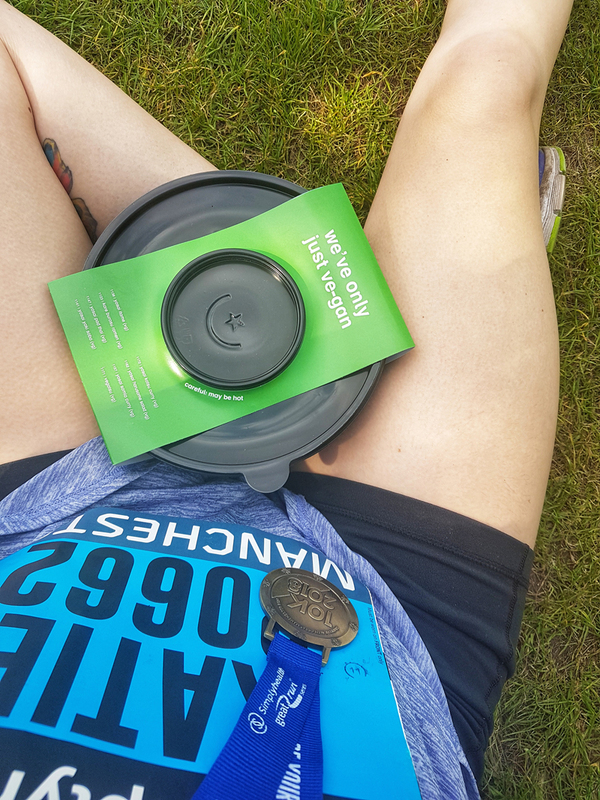 People shout out your name (if it’s on your bib of course!) and give you that final push. I love it. I don’t think there are too many races where you can watch the elites set off, and take part in the same one and route with the likes of Mo Farah, David Weir and Tirunesh Dibaba. All winners this year – Mo Farah and David Weir completing their 10k faster than I can run a 5k! You know I’ve done this race so many times, but this is actually the first one I’ve been able to get to the front and see all the elites set off. The wheelchair race, the elite women and then the elite men and the rest of the field. It was so good to see. I usually just watch afterwards on the TV highlights. They’re just normal people, I know, but it just feels so weird to be able to watch those you see so regularly on TV starting a race that you’ll be starting just an hour down the line. And of course, the crowd love it. The medals are always amazing with the Great Manchester Run. Quite often they’ll include Manchester in someway, usually with a skyline. They’re big, heavy and definitely make up a worthwhile reward after a hard race. This years gave memory to what happened last year with bees circling the edges. It’s quite simple compared to usual, but effective. Escpecially with it saying Buzzin’ on the back – such a fun addition. 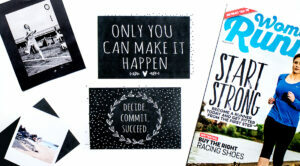 Be Your Greatest is also a fab quote. Because when I come to these races, I really feel part of them. I’ve been to many, many others in different towns and places, and when you don’t really know that area it doesn’t quite feel the same. Now I do actually have a big race closer to home – the Wigan ones. The Manchester ones are just bigger. And so that feeling of community, and being a part of something so huge whilst still feeling comfortable in the place just stands out more. It makes me want to keep coming back to do the Great Manchester Run. And I’m sure it’s one that I’ll enjoy until it stops. 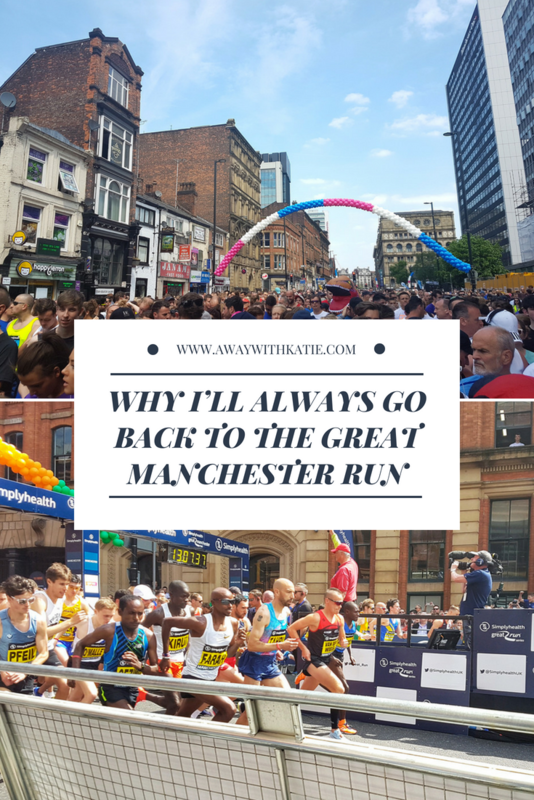 Ever done the Great Manchester Run?